(CNN) -- Irish international Alan Quinlan could be ruled out of the British Lions tour to South African after being cited for an alleged eye gouging incident in a top club match. Quinlan was cited for eye gouging on the basis of television evidence. The 34-year-old flanker was playing for his club side Munster in their 25-6 European Cup semifinal defeat to Leinster on Saturday. The match was watched by a record crowd for a club rugby match of over 82,208, but it was an incident captured by television cameras which has landed Quinlan in the dock. Pictures appeared to show him making contact with he right eye of Leinster captain Leo Cullen with independent citing commissioner John Byett ruling on Monday he had a case to answer. If found guilty, the minimum sanction is a 12-week ban, with suspensions in one tournament barring a player from all rugby, including internationals. The British Lions, who play three Tests against the Springboks, go to South Africa later this month. The precedents for Quinlan are unhappy, with Northampton and Ireland flanker Neil Best receiving an 18-week ban over a similar incident earlier this season. Quinlan was a surprise inclusion in Ian McGeechan's original 37-man Lions squad, getting the nod ahead of Wales captain Ryan Jones and England's Tom Croft. 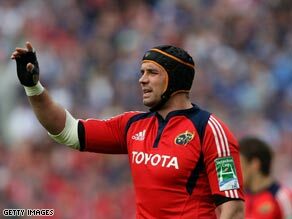 He received immediate backing from his Munster and Lions captain Paul O'Connell. "If it looked bad I am sure there was nothing in it," he told Press Association. "He is a tough player. It is the one thing he hasn't got in his record book." Munster provided no less than eight men in the original squad but since then the Irish province's scrum-half, Tomas O'Leary, has been ruled out with a fractured ankle and now Quinlan faces heartache.